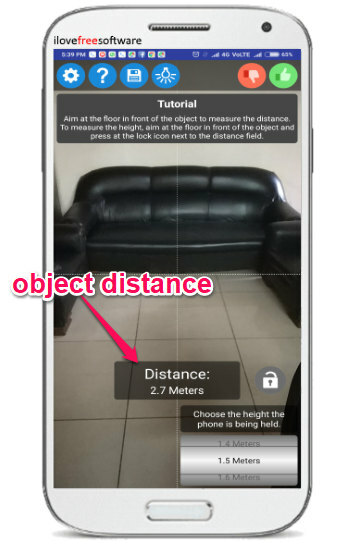 Here you will learn about 5 free distance measurement apps to measure distance using Android camera. Using these apps, you can easily find the distance between you and any object just by pointing your Android phone camera. These apps actually ask you to enter the height of the phone and point the camera cross-hair to the bottom of the object. After that, they use trigonometry to automatically find the distance of the object. They will show you the distance in real-time. Some of these apps even allow you to find height of the object. Do note that the results shown by these apps are not exact and are an approximation of the actual distance. So, to figure out which app is more precise, I have used them to check the distance of the same object. The results are pretty impressive and some of these apps even got the distance nearly accurate. To show you my experiment, I have created a simple table which will demonstrate the results generated by these apps when the phone is held at 1.5m high. The actual distance of the object is 2.7m. Distance Meter (by Kemal Duran) is one of the best free Android apps to measure distance using the Android phone camera. 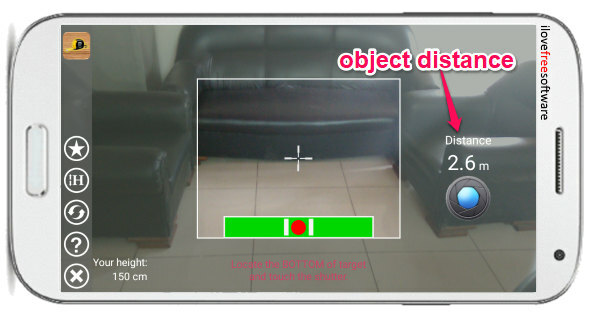 This app allows you to easily find the distance between you and any object just by pointing the camera to the bottom of the object. To start, simply open the app and then tap on the “H” button on the left to enter your height. After that, you’re good to go to find the distance of any object you want. For that, you would need to stand up and point the cross-hair of the app’s camera to the bottom of the object. As soon as you do that, it will automatically calculate the distance and show it to you in real-time. Smart Measure is also one of the best free distance measurement apps for Android. It allows you to easily find out the distance of any object you want just by pointing the phone’s camera to it. To use this app, simply open it and then set the phone’s height from the ground by tapping on the “Height” option visible on the left. After that, simply stand up and hold the phone to the height you have entered. Now, you can point the camera to the bottom of the object whose distance you want to find. As soon as you do that, this app will automatically calculate and show the distance on the camera screen in real-time. Distance Laser Meter Simulator is also a free Android distance measurement app that provides a simple way to measure distance between you and any object. 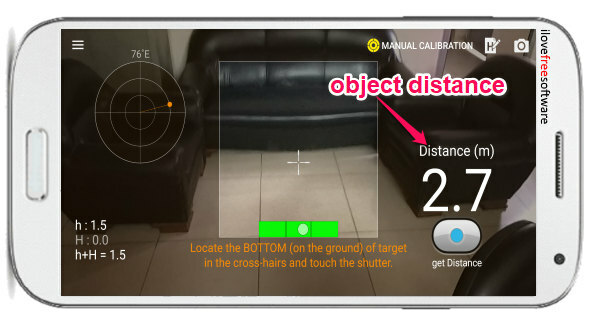 This app also uses your Android camera to calculate the distance. When you open the app, tap on the “Start App” button and then you need to set the device height at the bottom of the app’s camera. As soon as you do that, you can go ahead and point the camera cross-hair to the bottom of the object. 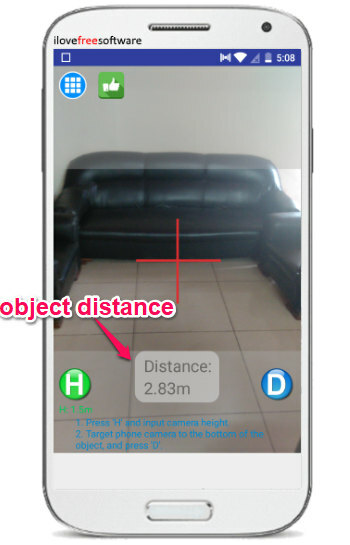 After that, this app can automatically calculate the distance between you and the object and display it in real-time. EasyMeasure is another simple distance measurement app for Android which you can use to find out the distance between any object and you. It allows you to use your Android camera to do the same. When you open the app, you can see the app’s camera and a slider on the left which you can use to set the height of the phone. As soon as you do that, you can simply point the camera to the object and keep the arrow-hair at the bottom. After that, it will automatically calculate the object’s distance and show it to you instantly in real-time. It shows the distance in centimeters. Distance Meter (by My Mobile Tools Dev) is also a free Android app that can help you measure distance using your phone camera. All you need is to open the app’s camera and point it to the object to get the distance. After you open this app, press on the “H” button and then enter the height of the device. When you’re done with that, hold your phone at the device height and point the red cross-hair to the bottom of the object. As soon as you do that, the distance between the object and you will be measured automatically. You can see the distance value in real-time on the camera screen. 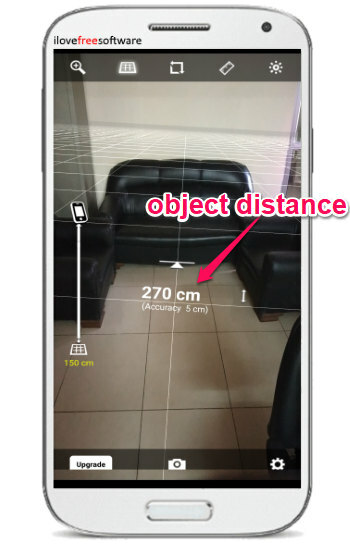 These are some amazing distance measurement apps for Android which makes it possible for you to seamlessly find distance of any object just by pointing your Android phone camera. They are very easy to use and finding the distance with these apps is really a cakewalk. So, go ahead and give these apps a try.